We climbed to the top of the Duomo on our first afternoon in Florence then beat a hasty retreat after all those steps for a well earned rest in our apartment. Next morning we hot footed it back to the Piazza Del Duomo. 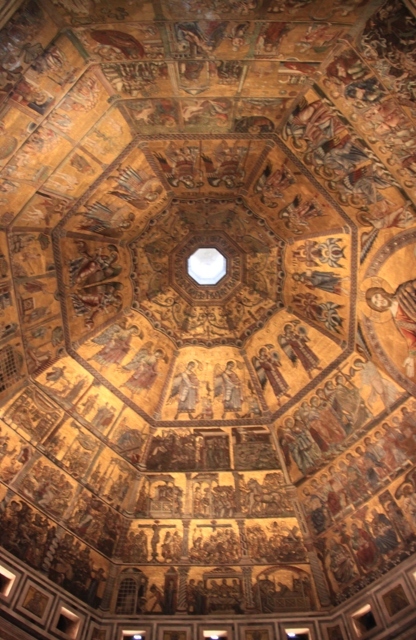 Our tickets for the dome climb included entrance to the Baptistery plus another climb up the bell tower and were valid for 24 hours. Husband likes to get value for money especially when it involves punishing and arduous climbing challenges, so next morning steps were retraced and we found ourselves back in this beautiful square. 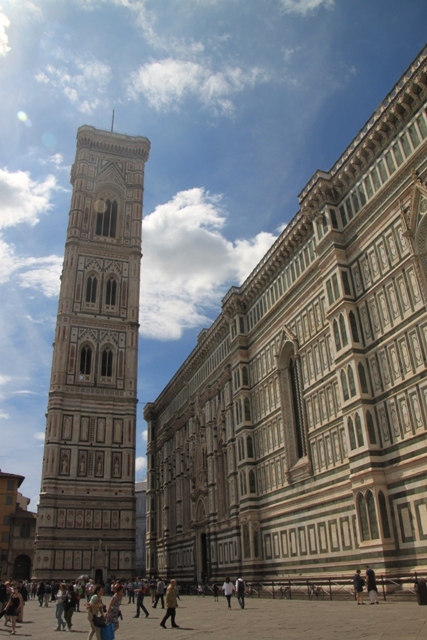 I love the Piazza del Duomo – one of my favourite places in Florence – it is definitely the heart of the city. Many people come just for the cathedral, this square is so much more than that. All the buildings are amazing – a vision in pink, white and green marble. There are stripes, rectangles, rosette windows, sculptures, circles and not an inch that is unadorned on any building. When you approach from the side streets and encounter this burst of colour it is amazing and breath-taking, no matter how many times you see it. Husband was all set to climb the Campanile or bell tower. Son and I last minute agreed that 400 plus steps yesterday was climb enough for us and we would sit this one out. Sit it out we did, perched on the edge of the pavement with gelato in hand, we watched the comings and goings and found loads to see. Son was especially taken with the horses, I was happy to people watch. Husband returned fairly quickly, 414 steps up the campanile he reported narrow spiral staircases and virtually no lines. Seems like we weren’t the only ones to sit this climb out! Lots of slits to peek through as you ascend (he told me) and a couple of fenced-in levels where you could go out and take in the sights. Great views not just of the city but also of the Duomo itself, I was happy enough to hear of this second hand and to look from ground level today. One must see for me though was the Baptistery. The oldest building in Florence, this dates from the 11th century and is where babies were baptised every year on 25th March. The doors are mind-blowing – gilded and called the Gates of Paradise they are intricate and detailed – I remember being wowed on our last trip, was looking forward to seeing them again but it was not to be. Covered in scaffolding we were denied this pleasure. We had to make do with the other doors – by no means shabby but just not up to Gates of Paradise level. Inside it is all about the ceiling. Also gilded and gorgeous, it shows the devil with horns and snakes coming out of his ears, purple demons and much more. We took a seat in the pews and just looked up. Son actually did lie down on the floor here to get a better look. He confirmed this was the best viewing position – we didn’t check this out. We saw a lot of people making for the cathedral and leaving it at that. 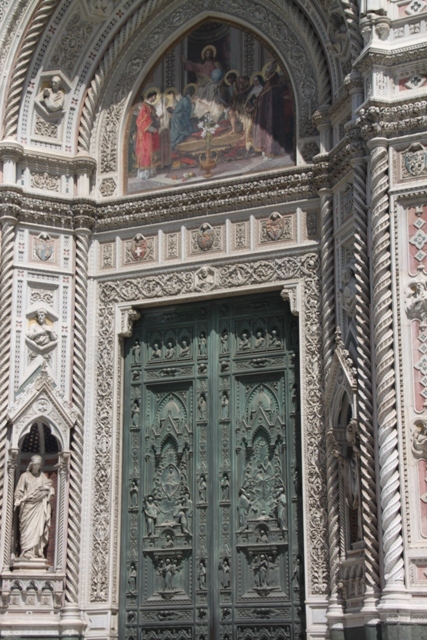 Don’t miss the Baptistery if you go to Florence and don’t miss spending time soaking up the atmosphere and architecture in this spectacular square. Beautiyful place! The cathedral looks majestic and very well fostered. But the points of interest mostly are in Italy. Oh I would love to check this out. The pictures you took are just amazing! 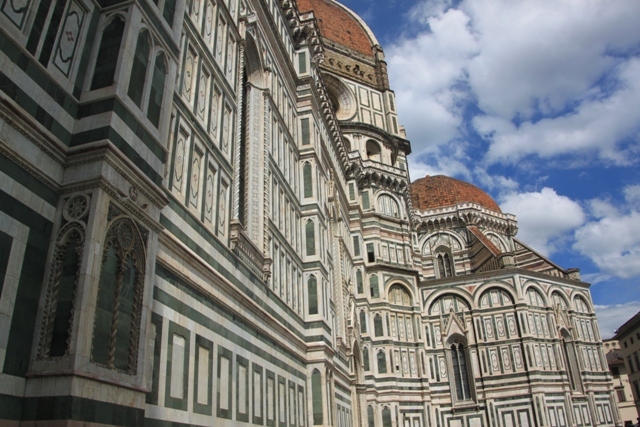 It’s fantastic Jenny – an amazing place to visit, but then everywhere in Florence (and Italy!!) seemed to be like that. Fabulous review. Love the last picture. How did you get that shot without lying down on the floor? Thank you!! Leaning back a long way in the pew and twisting my neck into an unnatural position – not recommended but the photo turned out ok!! I am with your son. I get myself into all sorts of weird positions to achieve the shot I want. I lay down on the marble floor of the Pantheon to get a worm’s eye view of the ceiling. I’ll have to try that next time and just ignore the weird glances!! Shouldn’t be paying attention to them anyway. I am going to start early building strength for these climbs! They are tough, but so worth it!! You can take it at your own pace though, lots of people did it in stages. The incredible views at the top make you instantly forget the pain too!! Why is it that the images of hell are so much more captivating than the images of paradise? Never thought about that before Melissa but it is very true – think gruesome and horror scenes just seem to draw you in more whether you like them or not! It was wonderful Rosemary – I could have sat there all day, so much to see and all the comings and goings with never a dull moment. Even my fidget of a son seemed quite happy to just sit and take it all in! The best Gelato I ever had was in the Piazza del Duomo. 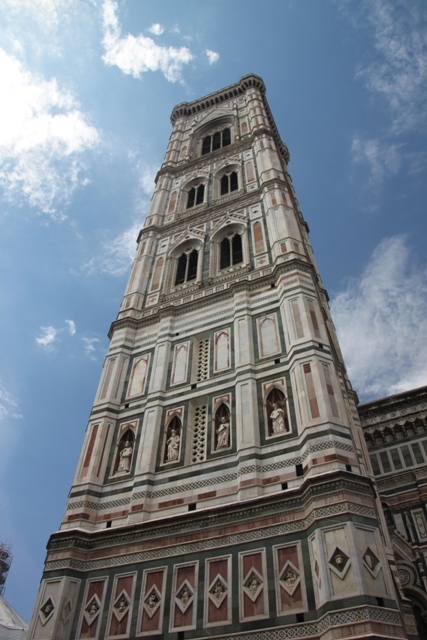 You are right, it is the heart of Florence, and even though the Duomo is a must see (and climb) it is worth the time to just soak up the atmosphere in the Piazza, lingering a while. I enjoyed the view from the Duomo, but definitely just sitting in this square was a big highlight – with a gelato in hand what could be better!! Just catching up on my blog reading and your posts on Florence brings back great memories. Its a great place and so full of history. Now I regret not climbing the Duomo! Would have to go back. You’ll have to return and do that sometime!! A lot of effort for sure but well worth it, the views are just amazing. Yes, one of those times travelling where we realise that we really needed more time than we thought we did. Looks beautiful! Especially that gold ceiling; everything is so intricate in Italy. I’m so excited I’ll be in Italy in about 2 weeks! Only thing is I wish the Italians were a little quicker with getting things done as our hotel is near the beautiful Trevi Fountain which has been under restoration for quite a few months now and looks like it will be for quite a while more. I’m not too surprised you ran into a similar situation with the Gates of Paradise. Guess we will just have to visit again! Hope you enjoy your holiday – know what you mean about getting things done! but I am sure it won’t spoil your time in Rome. It’s years and years since we went there but I remember loving everything about it – the location of the hotel sounds fantastic too! 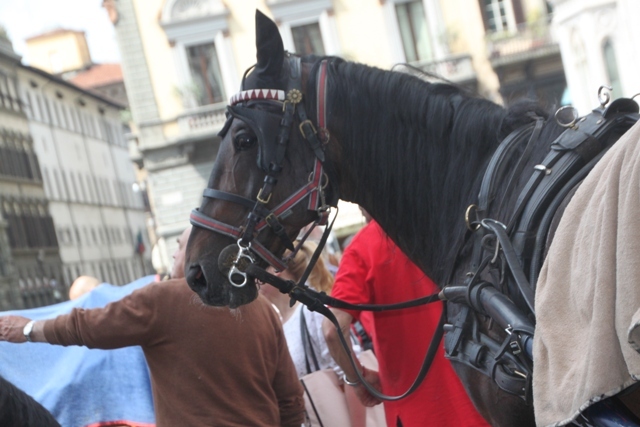 Beautiful photos of Firenze! BRAVISSIMA! Grazie mille Diana!! It’s a stunning city.